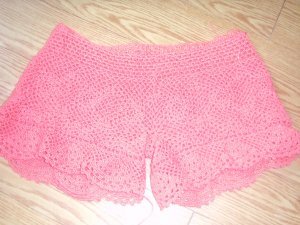 Now we are ready to crochet the last part of the shorts – The Lace Edging. The design uses a beautiful lace motif: a fan shaped lace with in between mesh. Note that in my project, I have 7 half motifs stitched around. 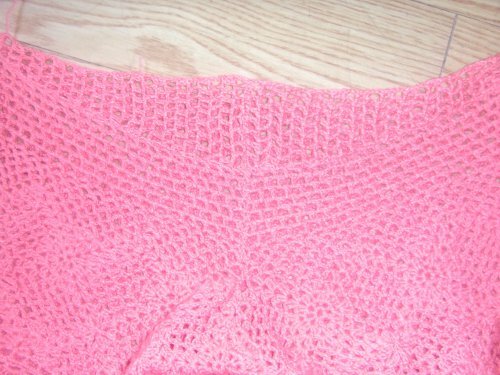 Round 1: dc 2ch (or 3ch depending on the tightness of your stitches)make sure that the mesh around would not be too loose nor too tight. Round 3: 6ch (counts as 1 sc and 4 ch). (Note: sc on space between 3sc’s of previous row). Do sc 4ch around. Round 4: Start on the middle of 4ch sp of previous row (slip st to the middle). Do 2 ( sc 4ch ) You will reach the center of your half motif. * 5 dc into the next sp, sl st on next ch sp, counts as 1 sc. Do 6 more sc-4ch repeats. * Repeat (*) around until you reach the two sc 4ch repeats you made on the start. Round 5: Start on the middle of 4ch sp of previous row (slip st to the middle). ( sc 4ch ) . 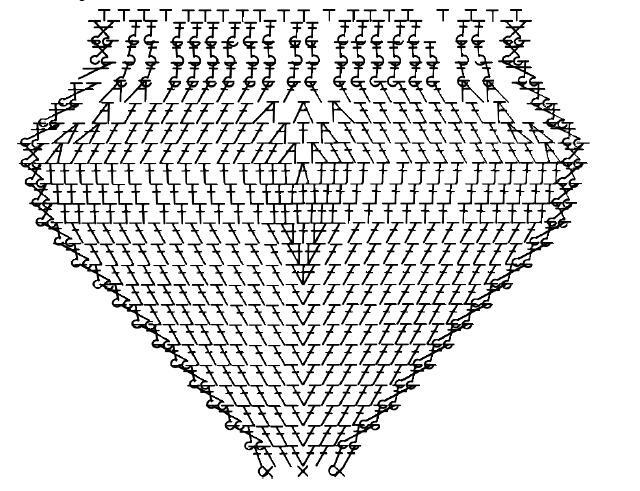 * Do a dc – 2dc alternately on each five stitches of previous row. sl st on next ch sp(count as one sc) 4ch . Do 5 more sc-4ch repeats. * Repeat (*) around until you reach the first sc-4ch you made on the start. Round 6: sl st to the middle. **ch, *2dc on dc of previous row, ch skip one st* Repeat (*) four more times, sl st on next sp. (counts as 1 sc) 4 ch. Do 4 more sc-4ch repeats.*. Repeat (**) around until you reach the first st of your round. sl st on first ch. Round 9. 3ch (counts as 1 dc) dc on next st . 2dc on ch space. repeat until you fill the center. (you should have 24 dc). sl st on next sp. *Do 2 mesh. 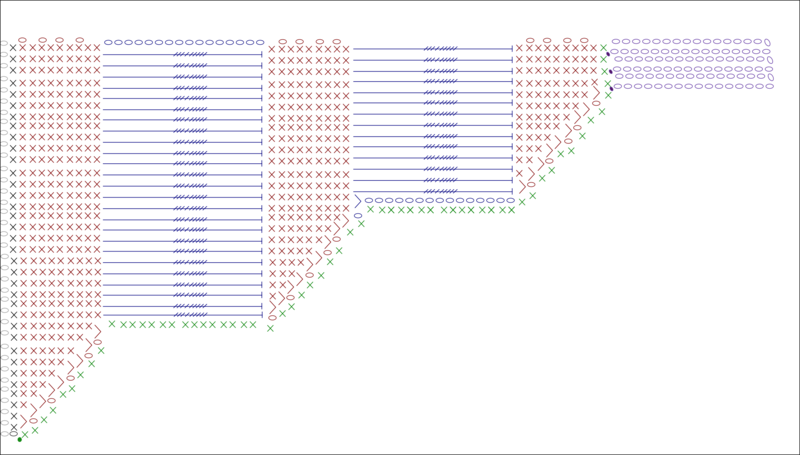 26 dc sl st on next ch sp* Repeat (*)around until you reach the last mesh of previous row. 2dc to close the round. Round 10. sl st until you reach 3rd dc of previous round. 3ch (counts as 1dc) dc on next st. *2ch skip two stitches, dc on next two st.* Repeat (*) five more times. 2ch sc on next ch sp. ** Do 1 mesh. ***2ch skip 2 st., dc on next two st*** Repeat (***) 6 more times, 2ch. ** Repeat (**) around. 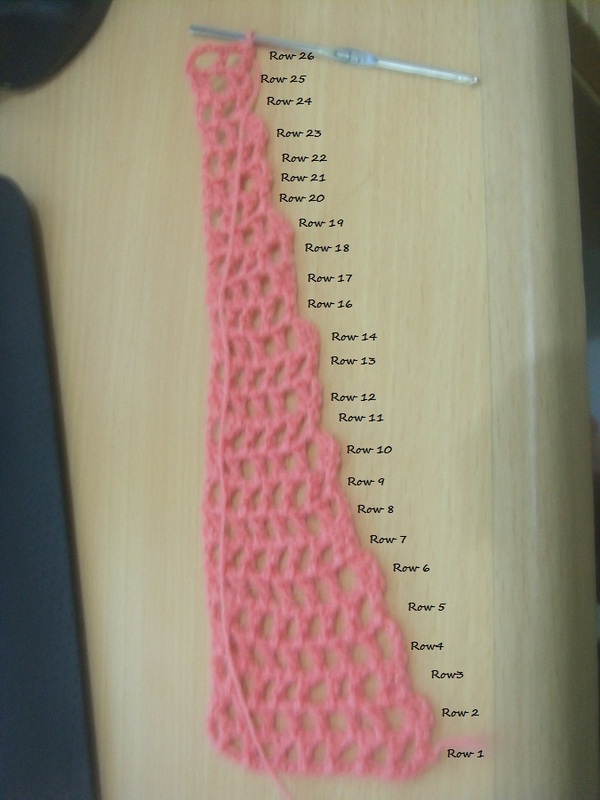 until you reach last mesh of previous row. ch 2 dc on next two st. ch 2. close the round. Round 11. sl s until you reach the first ch of previous row. 3ch (counts as 1 dc) dc on ch space. * 2ch skip 2st, 2dc on next ch space. * Repeat (*) 5 more times sl st. ***( **2ch sk 2st, 2dc on ch sp** Repeat ** 6 more timess. sl st on next ch sp) *** Repeat *** around. then close the round and complete first motif by doing 2dc on ch sp, 2ch skip 2 st, 2dc on ch sp, 2ch. YEI!!! DONE WITH THE LACE EDGING! See that there is still missing space for the shorts at the back. Remember to make two of this! Sew the back mesh we just made into each pair of back part of the short. The back part is the one with extra triangular half motif we made. Then sew the back parts together! When you get this, it is your assurance that you are sewing the parts properly. 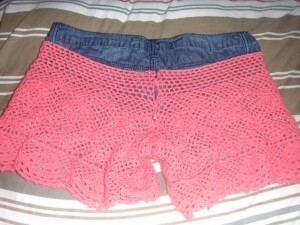 You can choose to put a lining to your shorts and a space for garter I lined mine and sew drawstring for the waist. 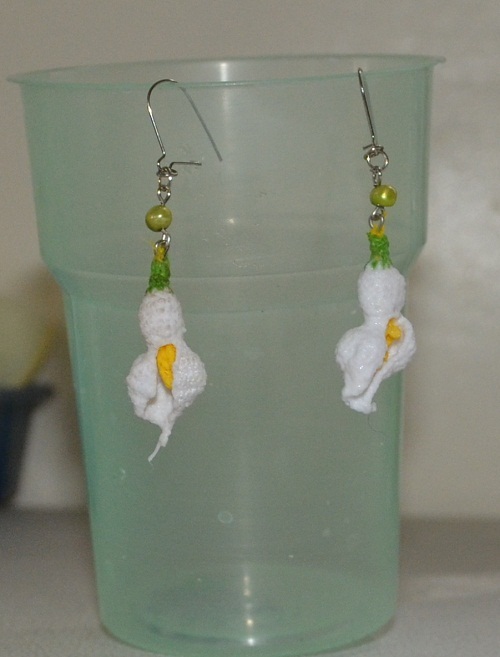 This entry was posted in Crochet, Hacking Ginantsilyo and tagged free crochet patterns and instructions on October 13, 2012 by Lorelie Dazo. 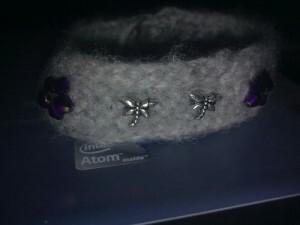 What the project is about: This is my attempt to felt the lambwool yarns I bought from China. 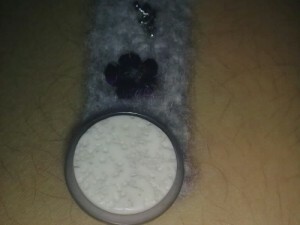 One of the skills I am attempting to learn as a crocheter is to felt wool. 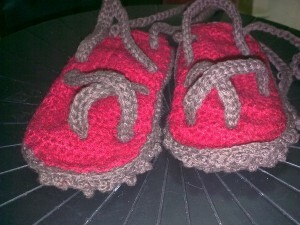 In this project, I tried to create slippers with felted sole for added comfort to the wearer. I was playing with my fiance’s niece when I saw one of her slippers lying around. I picked it up and got inspired to make a pair of slippers. It’s what I do usually. 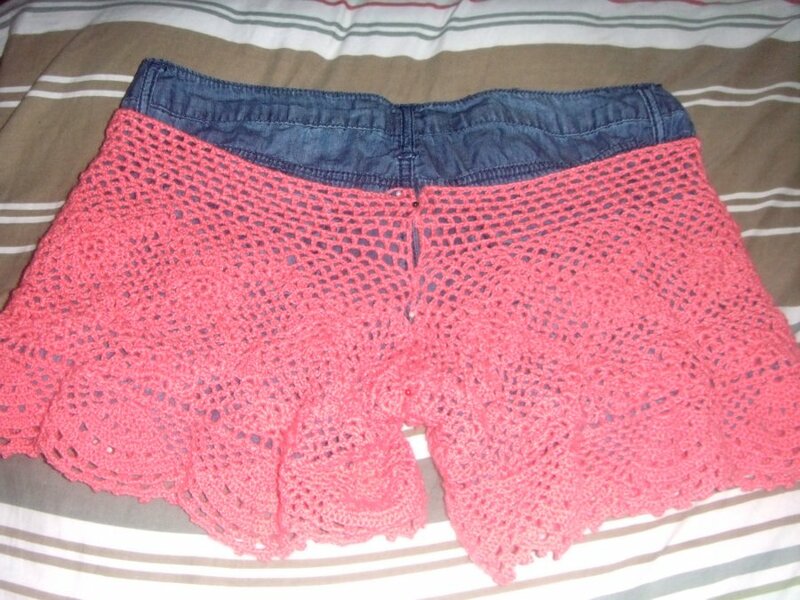 Be inspired then crochet. This pair of slippers is made with felted wool, for additional touch of softness and comfort. Plus ankle-wrap straps to secure the slippers on for extra flirty style. I also made the bottom sole textured for rough – look. Brown Yarn – this was bought in Indonesia at http://craftandme.com under their Soft Cotton Category. 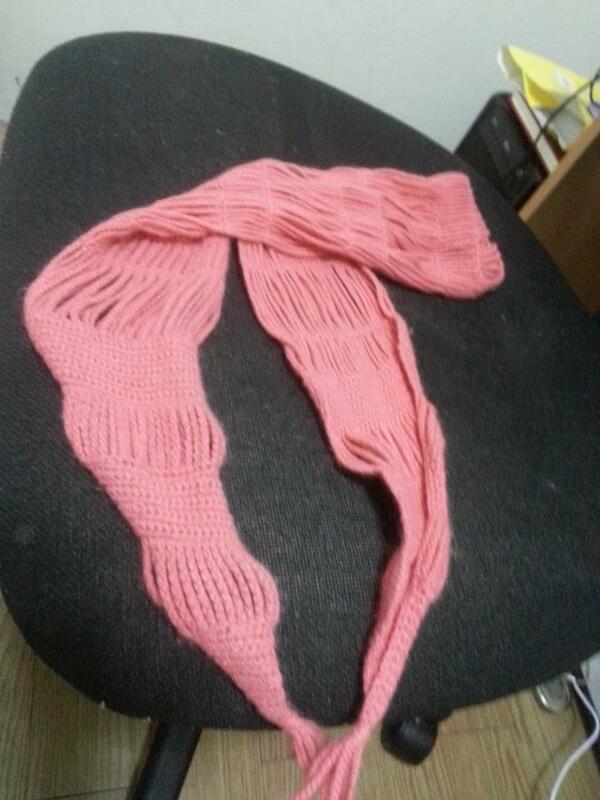 Red Yarn – this was bought in China at http://tradekey.com. I negotiated with one of the suppliers there and got a huge lot of lambswool from them. 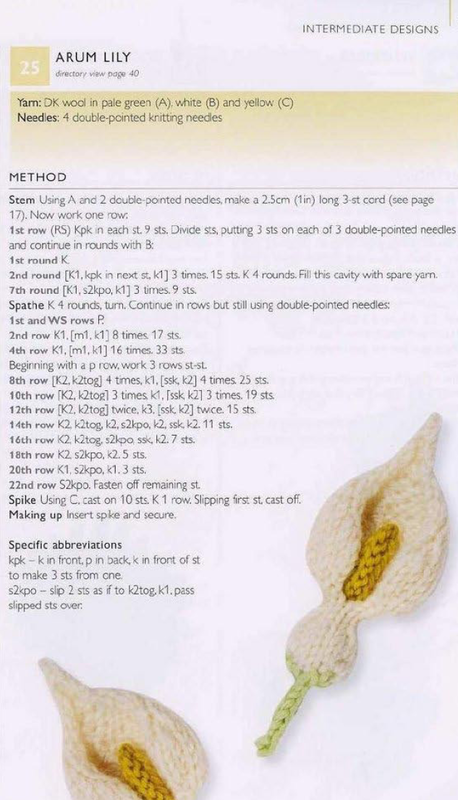 The textured effect was created by alternating treble and single crochet. Each round starts with 1 ch. 1st row: hdc on 2nd ch from hook. 17 hdc. (sk 1st ch) 3 hdc on 2nd ch, 17 hdc on back st of ch, 2hdc on last 2nd ch. Sl st.
2nd row: ch 1. 18hdc, (2hdc on next st) twice, 18 hdc, (2hdc on next st) twice. Sl st.
st. 16 hdc, (2 hdc on next st) twice. 2 hdc, (2 hdc on next st) twice. 16 hdc, (2 hdc on next st) twice. 2 hdc, 2hdc on next st. slip st.
4th row: ch 1, 20 hdc. (2hdc on next st) twice. 2 hdc, . (2hdc on next st) twice. 20 hdc, . (2hdc on next st) twice. 2 hdc, . (2hdc on next st) twice. 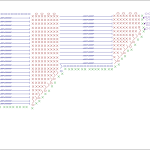 Sl st.
9th row: ch 1, sk 1st st, 4 hdc, 2 hdc on next st, 7 hdc, 2 hdc on next st, 2 hdc. Turn. 13th row: ch 1, sk 1st 2 st, 3 hdc. Sl st. 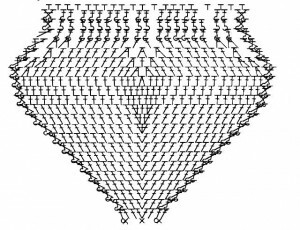 The following stitches are done with alternating treble and single crochet. Every round starts with 1 ch. 1st row: 1 st on 2nd ch from hook. 17 st (sk 1st ch) 3 st on 2nd ch, 17 st on back st of ch, 2 st on last 2nd ch. Sl st.
2nd row: ch 1. 18 st, (2 st on next st) twice, 18 st, (2st on next st) twice. Sl st.
3rd row: ch 1. 2 st on 1st st. 16 st, (2 st on next st) twice. 2 st, (2 st on next st) twice. 16 st, (2 st on next st) twice. 2 st, 2 st on next st. slip st.
4th row: ch 1, 20 st. (2 st on next st) twice. 2 st, . (2 st on next st) twice. 20 st, . (2 st on next st) twice. 2 st, . (2 st on next st) twice. 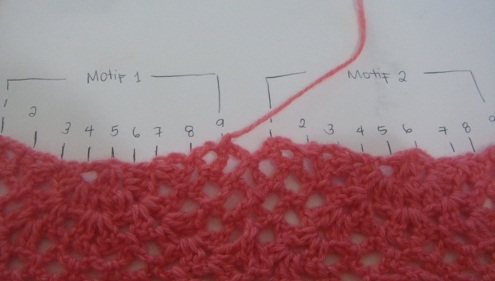 Sl st.
9th row: ch 1, 18 st, sl st.
Strap 1 (Use two strands of Yarn A): ch 15, turn, 14 sc, turn, 13 sl st. Fasten Off. 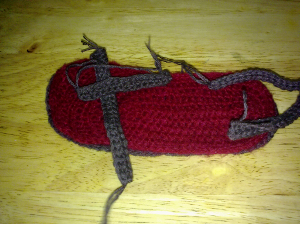 Strap 2 (Use two strands of Yarn A): ch 23, turn, 22 sc, turn, 21 sl st. Fasten Off. 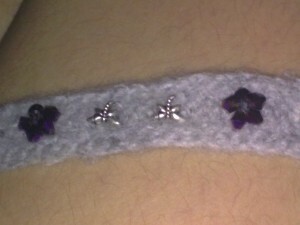 Strap 3 (Use two strands of Yarn A): ch 33, turn, 32 sc, turn, 31 sl st. Fasten Off. If you used faux-animal hair, skip this step. 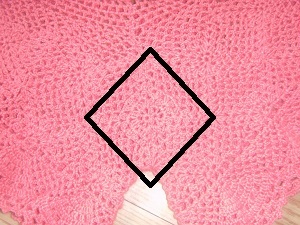 Soak Top Sole (if Yarn B is untreated wool) in hot water (preferably water that just got boiled) with dishwashing liquid for 5-10 minutes (as desired – or longer). Remove the cloth from hot water. Be careful with being burned. Gently hand wash the cloth until felting occurs. Soak again to hot water. Repeat procedure til desired texture is achieve. Wash the soap in cold water. Let the sole dry. Fit Top Sole and middle sole on top of each other. Position the straps as shown on the left. Secure the straps by sewing it (into top sole to middle sole) firmly and tightly. Make sure no straps are loose. Sew the straps 4 and 5 near the back of the sole. Fit bottom sole and top sole together. 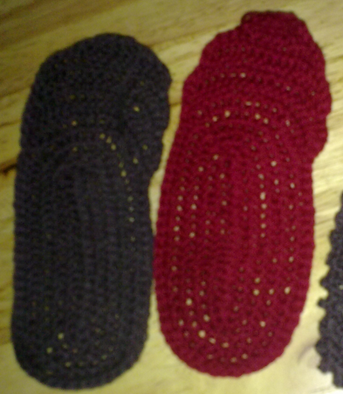 Using Yarn B, attach two soles by sc st together. 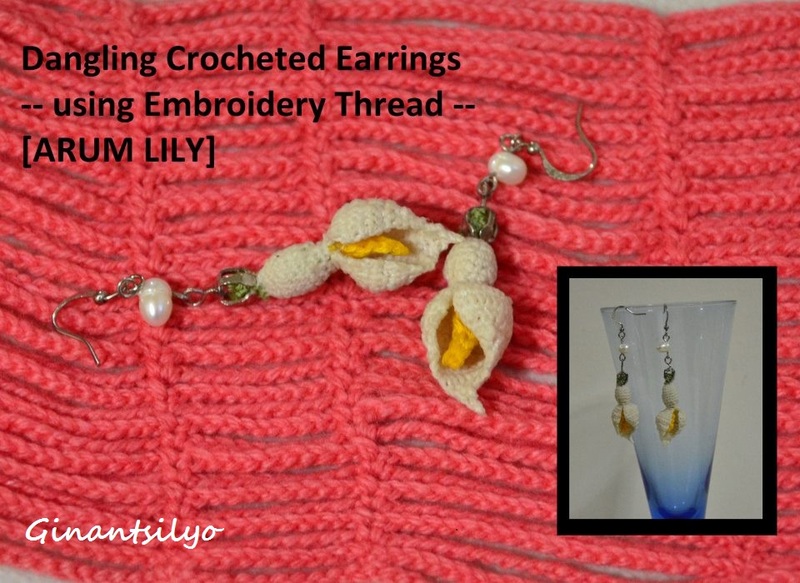 This entry was posted in Learn Ginantsilyo By Project, Patterns and tagged free crochet pattern, free crochet patterns and instructions on September 13, 2010 by Lorelie Dazo. 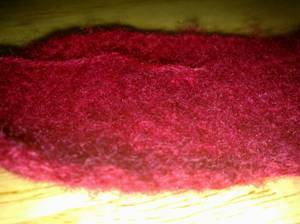 Felting Wool – ahh the glory of it. 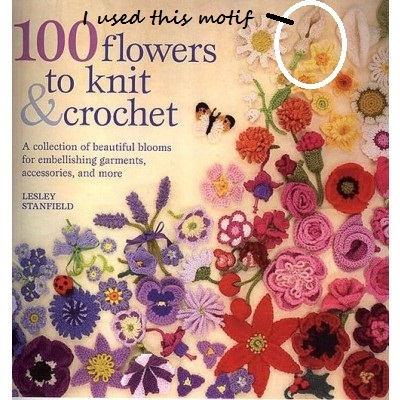 This was one of the reasons why i’ve been wanting to have wool yarns. 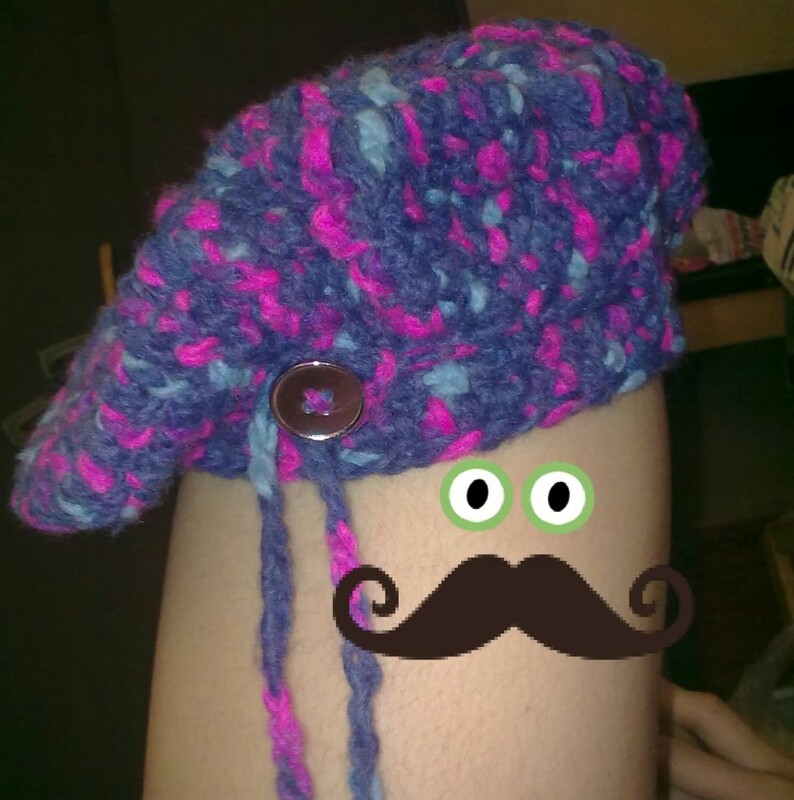 I want to try felting and hehe. it was not easy as i thought. The yarn did not felt the way i wanted it because my (lack of) patience took over. 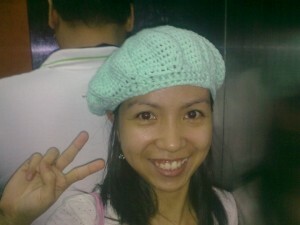 This entry was posted in Blog, Crochet, Gawang Gantsilyo and tagged felted crochet, free crochet patterns and instructions on November 24, 2009 by Lorelie Dazo. It wasn’t an original design. In fact if you visit the stalls in mines view and wright park, you would see a lot of these in their shelves. What inspired me to make one too was it was when I obtained my first batch of baguio yarns and the lady who pointed me the place to buy them was making on these particular top. I bought one from one of the seller and tried to hack the stitches used for the blouse. 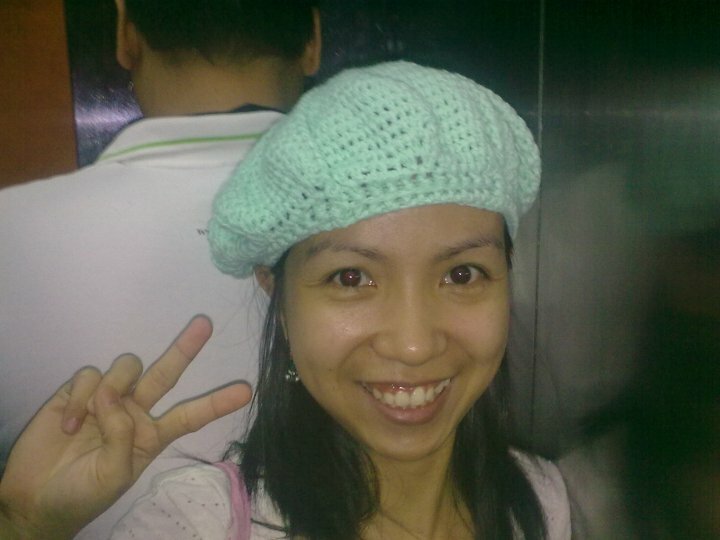 This entry was posted in Hacking Ginantsilyo, Patterns and tagged crochet blouse, free crochet patterns and instructions on September 5, 2009 by Lorelie Dazo.